To which those not protected by Blue Privilege might respond: Welcome to our world, FOP. 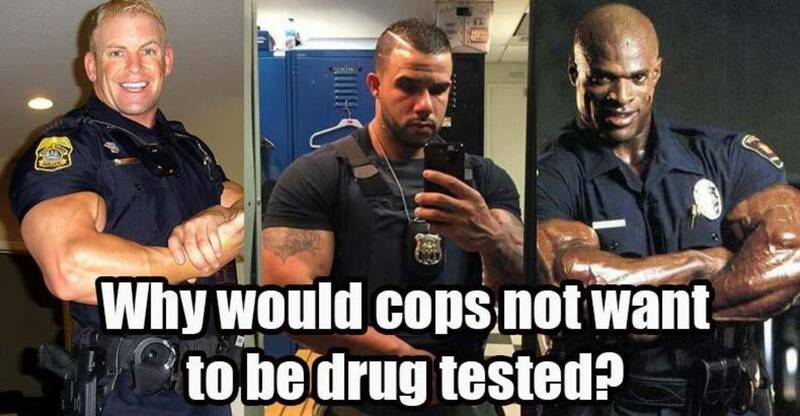 Another blatantly obvious reason for police opposing public scutiny of their urine is that it could reveal the usage of such things as anabolic steroids. Police officers are no stranger to ‘Vitamin S’ as many of them have not only been caught using the rage-inducing hormones, but selling them as well. The union complaint may be as much a negotiating tactic as an assertion of Blue Privilege: Since April it has been involved in highly contentious contract arbitration with the Mayor over budget restrictions imposed through the city’s “Act 47 plan,” a financial restricting program for municipalities trying to stave off bankruptcy. The plan called for a pay freeze this year, followed by a one percent raise next year, and raises of two percent in 2017 and 2018. These increases – which would be eagerly and gratefully received by people in the still-struggling productive sector – are disdained by the police union as insufficient. Residents of Pittsburgh who are found in possession of small amounts of marijuana can still face criminal charges that “can cost [them jobs, housing, and leave them with a criminal record,” pointed out the Post-Gazette on November 17. The City Council is considering a measure that would permit the police to issue a non-traffic citation instead of a misdemeanor summons for possession of less than 30 grams of marijuana or eight grams of hashish. This would result in a city fine of $100 and seizure of the contraband – in other words, it would offer a reduction in prohibition-related penalties while preserving the drug war infrastructure. This helps explain why the proposed city ordinance is supported by the Pittsburgh Police Bureau, whose personnel are seeking to retain their special immunity against the kind of drug war-inspired infringements of personal liberty routinely inflicted by them.